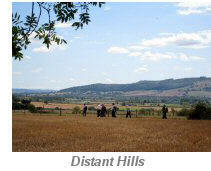 Enjoy a 6 or 8 mile circular walk from the market town of Pershore. Pershore has an interesting heritage and offers an opportunity to visit the medieval Abbey which was founded in 689AD. 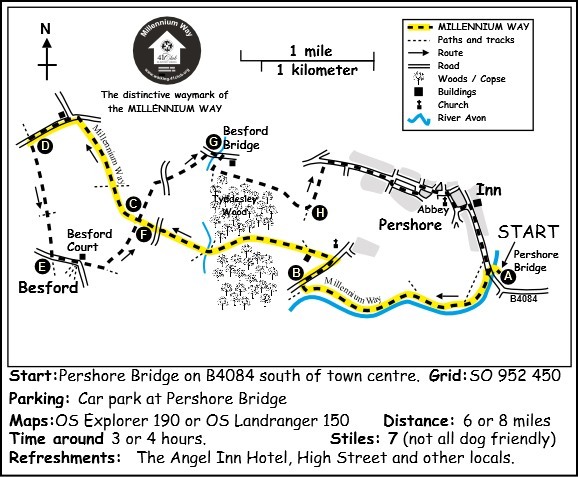 The walk starts from the ancient Pershore Bridge, follows the River Avon for a short section and offers pleasant woodland and open countryside with only gentle inclines. For the first half of the walk ( to point D ) you will enjoy the delights of The Millennium Way, and where you will be guided by the distinctive green Millennium Way waymarkers. Find out more about the walk by clicking on the information icon. B. Turn right on main road and on reaching garden centre cross road and go left up slope ( by a house called "The Farthings" ) marked as a bridle path. At the top of the lane go through gate at right of Woodmans Cottage and then ahead between fencing ( ignoring first footpath right ) to reach cinder path. Go left on cinder path and keep ahead with ditch left to arrive at wood. 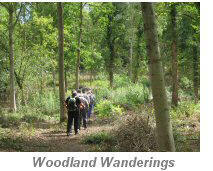 Enter the ancient Tyddesley Wood through the stile/gate and go ahead down bridle path through the wood. Cross logging road and continue through wood ignoring side paths to maintain line down to take bridge over Bow Brook. Go through gate and continue up field with hedgerow right, passing under power lines, to take gate at top corner of field to road (Salters Lane). Go left for 50yds on Salters Lane then take gap right and go ahead across field to right hand field edge. (If footpath has not been re-instated after ploughing go right to walk perimeter of field to reach same spot). If you are walking the shorter route take the first footpath/bridge right and follow instructions from F below. For the longer walk, continue with hedge right and 50yds before field corner take stream bridge right. C. After 50 paces turn left through gap into field. Go diagonally 1/2 right across field centre to find a waymarked footbridge between two oak trees close together, the right one ivy covered. Cross footbridge then ahead over next field to find footbridge to left of oak tree in top right field corner. Cross footbridge, go diagonally 1/2 left to find field corner gap to road. You are now at Crab Common T-junction. Turn left and follow road in direction Crome / Kempsey for approximately 600yds. D. Here you will leave The Millennium Way (which turns right) and instead take footpath left through wide gap into field. (Ignore the metal fingerpost and follow the yellow plastic Worcestershire County Council waymarkers on the posts as directed) Continue directly ahead across field keeping near to hedge right over three fields, to take footbridge over ditch. Continue diagonally 1/4 left directly across field towards barns in far distance, then take kissing gate to road by houses. E. Go left on road passing Lower Drive Estate, then just past the entrance to Besford Court private estate take stile left into playing field. (There are benches here with a view of Bredon which makes a good halfway stopping point.) Stay ahead in playing field keeping hedge left and passing white house left to take metal kissing gate to field. Go diagonally 1/4 right here across field to a footbridge then across centre of next field to find and take gated footbridge. F. Go directly across centre of next field. On reaching hedge, cross small plank bridge ( located at the end of a line of trees ) and go right to walk with hedge right & ditch left, to reach lane. Cross lane to take metal gate to next field then go diagonally 1/2 left to take mid fence gate and go diagonally 1/2 right across next field to cross stile to road. G. Turn right on road and after crossing bridge over Bow Brook take footpath right over stile and continue along with brook on right and fruit orchard on left. After just under 200 yds you will reach a waypost by a two-pole electricity supply). Turn left here up path and take stile at top then the gate immediately left to walk gently uphill with wire fence and wood on right. The track risies gently to exit via metal gate. Cross track and take another gate continuing directly ahead gently uphill keeping wood right. Continue along edge of field with wood right. On your left you will soon have a fine view of Pershore Abbey in the distance, which we can visit near the end of the walk. H. At the T-junction of paths follow waymarker left past a small copse and go ahead towards grey barn and houses ahead. Go past grey barn to reach road then turn right. Continue a gradual descent down road to T-junction then cross directly over to take New Road in the direction of The Abbey ahead. Follow road around to crossroads and turn right, to pass the Talbot pub on left. At small roundabout ahead, go left and enter Abbey grounds through metal gate right. 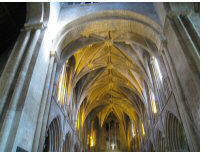 (Here you might like to visit Pershore Abbey). Go past front entrance of Abbey and exit grounds by far left corner gate to road. Cross over road to enter the town and go ahead to the main road ( B4084 ) turning right in the direction of Evesham. Head out of town to eventually turn left over the old bridge to return to your starting point at the car park. With your back to the Abbey door, go forward down the drive to pass through the metal gates, then turn left along the path veering slightly right down the avenue of mature oak trees. Exit by brick wall to your left and cross road to take public footpath left. Go along narrow track passing the sports club, turning right at the end of the track to walk with wall left and hedge right. Go past a length of curvy wall then straight on following public foot path sign to walk between fence and wall. Stay forward gently downhill then over step stile to emerge into field. Turn left to exit to road via small step stile, then go right to to cross the old bridge and back to the car park. 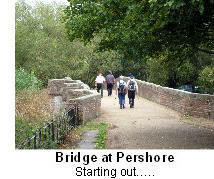 Our walk starts at Pershore bridge over the river Avon in the south of the town. In 1290 Sir Nicholas de Mitton left 12d(5p). for the repair of this bridge. By 1322 it was again falling down and stayed like that until 1346. No agreement could be reached on who was to pay for repairs- the people of Pershore or the Abbot of Westminster who owned the adjacent land , but after five years of legal wrangling it was decided in 1351 that the repairs to the bridge should be shared between the abbot and the town. In 1388 it was again in ruins and when Pershore Abbey was destroyed some of the materials were used for repairing it. By 1607 it was again in need of repairs but on 5 June 1644 Pershore Bridge was destroyed by King Charles I army on the way to Worcester to delay the Roundheads from following. Forty men were drowned owing to the haste with which the destruction was completed. The present bridge is a structure of various dates due to its many collapses and rebuilds. The fourth arch is wider than the rest and is the one broken down by Charles I, was repaired in stone, locally said to have been taken from the ruins of Elmley Castle. The Dean and Chapter of Westminster now repair Pershore Bridge, paying the county council for doing the work. 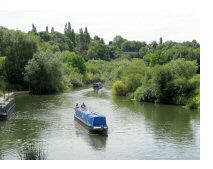 The River Avon is navigable from just above Stratford –on- Avon down to Tewkesbury on the River Severn. The locks and weirs on route restrict the boats to 72 feet (22M) long 13 foot 6inches (4.11m) wide 10 foot (3M) high with a draught of 4 feet (1.18M). The navigation works were first authorized by Order in Council of Charles I in 1635. In 1717 the River Authority was divided into Upper and Lower Avon Navigation but by 1874 the upper reaches were in disrepair. The lower section was still in use in the Second World War with a regular barge plying between Tewkesbury and Pershore. Tiddesley Wood is part of an ancient woodland and enclosed deer park once owned by the Abbot of Pershore Abbey but now managed as a nature reserve. In spring there are areas carpeted with bluebells, wood anemones, violets and cowslips. Besford (Bettesforda X Cent.) was granted a charter by King Edgar in 972. The church dedicated to St Peter has one of the few wooden naves in the country. Besford Court was rebuilt in1912 but retains 16th C features and its fishponds. A former owner, Lord Beauchamp, removed much fine oak paneling and had it installed in Madresfield Court. A monastery was founded in Pershore in 689 by King Oswald. A later charter was granted by King Edgar in 972. All that remains of the 11C Abbey of Pershore is the transept and chancel. It is now utilized as the parish church and is dedicated as The Holy Cross. At the dissolution the nave was demolished and later the north transept collapsed. The market-place is planted with trees. The main streets have a number of Georgian houses. The buildings on the east side of the main street back on to the River Avon and have gardens running down to the bank. The two churches of Holy Cross and St. Andrew are both in the west of the town, the churchyards being separated only by the roadway. The Plum festival is celebrated in August.